As Pinnacle’s Director of Trading my job is to manage risk, and the same should be true for every bettor out there trying to make money. 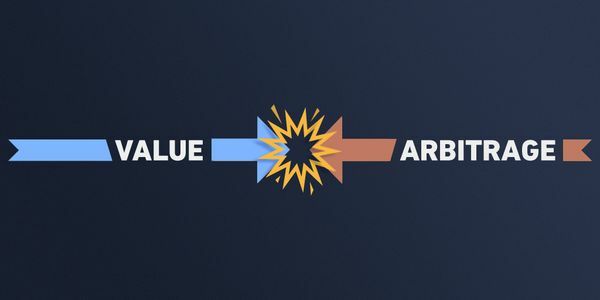 I love reading about how bettors approach risk and bankroll management and was inspired to make my first contribution to Betting Resources to expose some misconceptions around one of most widely debated and often misconceived topics – Arbitrage vs. Value Betting. One of Pinnacle’s stand-out policies is that we welcome Arbitrage. Arbitrage betting is the search for risk-free profit via price differential, which can commonly occur because a bookmaker offers odds that don’t truly reflect the underlying probability. The truth is, Arbitrage is a sound betting strategy1 . In fact, it’s the basis of much of the profit generation within the trillion dollar world of investment banking. Most bookmakers dislike Arbers because they don’t fit their target audience, but my trading model is focused solely on volume – which includes Arbitrage. I don’t mind what the intention behind a bet is so long as bettors follow our rules. Arbitrage betting has evolved to the point of having its own community and strains of thought around how to profit from the circumstances that lead to price differential. Our Arbitrage explanation offers several potential reasons for arbs occurring but by far the most common is simply because bookmakers make different assessments of the underlying probability for a given event – they offer over-generous odds. Arbitrage betting has a steady growth pattern as all positions are fully hedged; there is no variance as there is no risk – all your bases are covered. Once that situation occurs to complete an Arb, a bettor needs to find the most accurate assessment of that market and bet both sides with proportional stakes. Pinnacle is one of the sharpest bookmakers around, so we will often serve that purpose for Arbers2. The suggestion I often read is that if the odds are wrong, why not just take a naked arbitrage position and bet on the value? This rather simplistic assessment ignores key issues around risk and bankroll management, and is what inspired me to write this article. With proportionate staking, placing a bet on Yes – Barcelona to win the UCL – at 2.120 AND the No with Mystery Bookmaker will guarantee you a profit regardless of the outcome. Using Arbitrage to indicate incorrect odds but stakes only on that option thereby incurring real risk. There is a logic that says that Arbitrage simply exposes a Value Betting opportunity at Mystery Bookmaker. Instead of hedging the wager at Mystery Bookmaker on the No with a wager on the Yes at Pinnacle, Value Betting suggests that the Pinnacle line is a better reflection of the true probability of Barcelona winning the Champions league – meaning the Pinnacle price is correct – and the price of Mystery Bookmaker is incorrect. They have got the odds wrong so why not skip the Arb and simply take advantage of the inaccuracy that offers ‘value’. If we accept the assumption that Pinnacle has the correct price then the fair chance of Barcelona not winning the UCL – the No bet – is 53.9% (this removes the bookmaker margin shown in the table above). This is a 4.4% difference from Mystery Bookmaker’s assessment of 49.5 (53.9-49.5). Betting the No option with Mystery Bookmaker should therefore yield a return equal to the fair probability MINUS the wagered probability. 1.95 translates into 51.3%. Thus the expected return should be (53.9-51.3)=2.6%, which is better than most bank accounts so seems attractive, but is this the whole picture? Betting with odds of 1.95 and implied probability with a margin of 51.3% literally means that you have to win 51.3% of your bets to break-even (were it a fair coin toss you would just need to win half or 50% of bets to neither win nor lose). We cannot, however, simply use a single event to test the efficacy of the Value Betting approach; we need to look a significant sample size. Using a sample size of 1,000 bets at odds of 1.95 this equates to 512.8 bets won (see the graph below). What this tells us is that the chances of 512 or less successful bets with the given edge is 18.6% – based on the Binomial distribution. The chances of winning 450 or less events with the given edge is 4.91%. Value Betting’s growth curve – what happens to profitability with more bets over time – largely depends on the underlying fair probability as the edge – as illustrated above in our Barcelona example – is the important factor in determining the appropriate stake via a Kelly approach (you can learn about Kelly Criterion here). Arbitrage betting has a steady growth pattern as all positions are fully hedged; there is no variance as there is no risk because all your bases are covered. 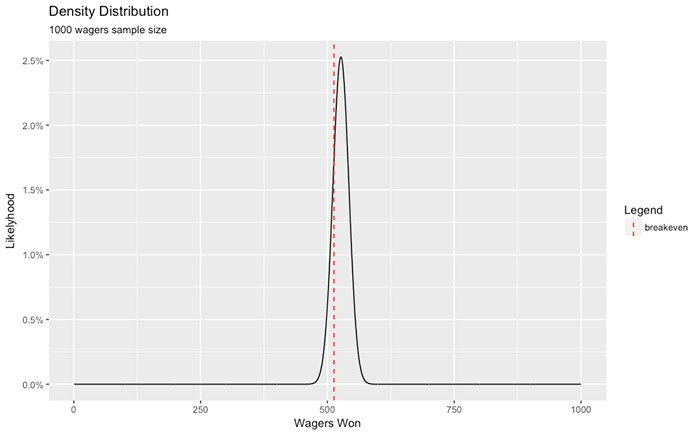 Assuming a starting bankroll of 1,000 units and applying a Kelly Criterion based betting strategy with a 2.66% edge over 1,000 separate Monte Carlo Simulations, each with 1,000 wagers. The graph below illustrates what we should expect to happen. The mean of 1,000 Monte Carlo simulations generated a profit of ~500 units. The top 10% generated a profit of ~3,000 units – this is our best case scenario – and the bottom 10% generated a loss of ~500 units. 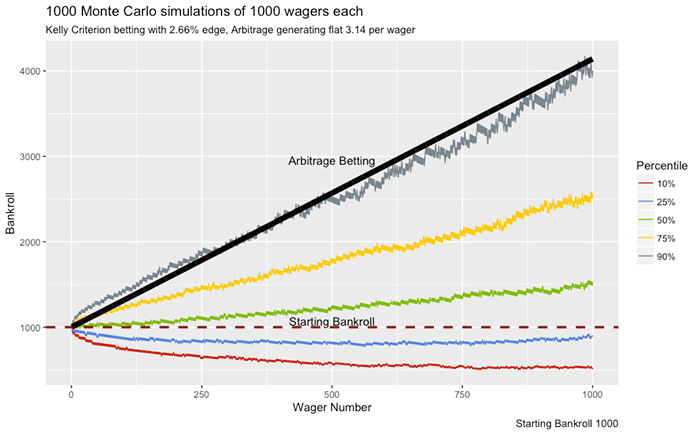 In over 1,000 wagers, Arbitrage betting performed as good as the top 10% of the Monte Carlo simulations and as I have reiterated throughout this article, it has no variance. Kelly Criterion is the sensible strategy for bankroll growth, and for those in between a mixed trading strategy is recommended to ensure a proper bankroll growth. The reason that Value Betting performs this way compared to Arbitrage betting has to do with Bankroll management which must be proportionate to the underlying risk. If you aren’t betting this way, read this staking method article or you’ll quickly destroy your bankroll. With Arbitrage betting, this issue evaporates. A higher percentage of the bankroll can be wagered as there is no risk attached. The example used above with ~200 units wagered, was chosen deliberately to be realistic for an average bettor starting with 1,000 units. Given the point already made about the relationship between risk and bankroll it is clear that in order to be viable, Value Betting strategies can’t risk 20% of their starting bankroll on a 2.66% edge wager; the risk of ruin would be too great. Sure, with an unlimited bankroll and betting limits Value Betting trumps Arbitrage but in the real world Kelly Criterion is the sensible strategy for bankroll growth, and for those in between a mixed trading strategy is recommended to ensure a proper bankroll growth. 1 Theoretical Arbitrage is risk-free from a mathematical perspective, but this doesn’t account for externalities. These include whether Mystery Bookmaker is willing to accept your bet (they may profile Arbers), whether they feel their odds were so ‘wrong’ that the don’t honour them, or whether you can bet at the required proportional stake at Mystery Bookmaker relative to the stake at Pinnacle, where limits aren’t an issue. 2 While Pinnacle odds are certainly very accurate – independently judged – they won’t always necessarily reflect the true underlying probability of a given event. Many factors will influence their accuracy.